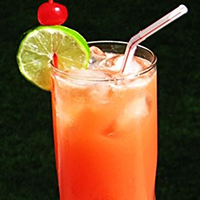 Combine the 3 Spirits, 2 Juices, and Grenadine, in an ice filled cocktail Shaker. Cover, shake well, and pour into a Collins Glass. Top with the Soda, give it a good stir, garnish accordingly, insert a long straw, and get ready for some island fun, with your delicious... Reef Cup. Enjoy!